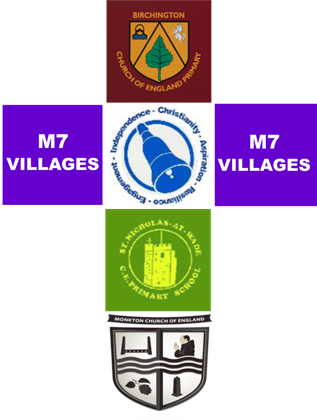 At Birchington CE Primary School, Monkton CE Primary School, St Nicholas at Wade and Minster CE Primary School we have chosen to work in a collaborative and supportive partnership called the ‘M7 Villages’. Our focus is the improvement of all schools within our group. We share expertise, training opportunities, resources and a commitment to help each other achieve the highest of standards for all our children. Working closely together allows opportunities for curriculum innovation and leadership development. As a group of Church of England schools our Christian ethos, sense of spirituality and focus on the well-being of our pupils and staff is intrinsic to this work. ‘From whom the whole body, joined and held together by every joint with which it is equipped, when each part is working properly, makes the body grow so that it builds itself up in love’.